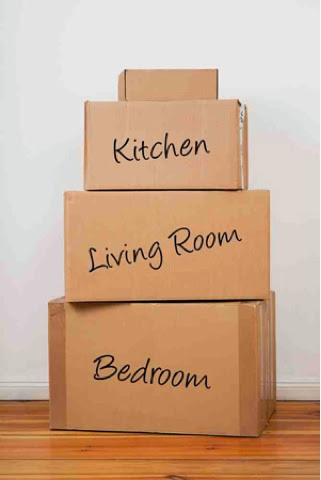 Emma in Bromley: Moving House - The Fear! It's been well over a year (more like 5) since we decided to move house - our little man is firmly settled in reception at primary school and as a family of four, we've more than outgrown our bijou 2up2down starter home. Hubby gets home just at bed time - usually when I'm a soggy, tearful mess after bathtime and witching hour. We both do bedtime - one child each. That takes us until about 8.30pm when I then cook evening meals for us - never the same food - I'm veggie, husband is all about the meat. After cooking, eating and cleaning up, ironing shirts for the next day, sorting out the school bag and home work folders (reception get 2 homework folders a week! ), preparing as much of the packed lunch as I can and suddenly realising it's way after 10pm and I haven't even sat down all day - the last thing I have the energy to do is sorting out the house - all I want to do is watch a bit of Revenge/Bones/TOWIE/ mooney boy/ revolution or curl up and sleep! I'd also quite like to paint my nails, do a bit of my own hobby, blog or read a book but given it's 11pm and I'll be up at least twice in the night and out of bed by 6am - I can't fit everything in can I?! So we made a decision, a tough one, we're taking advantage of my kind inlaws and taking advantage of them while we sort out our home. We've hired a storage unit and I've bought a million (well, 8) massive plastic storage boxes from Jojo Maman Bebe for the kids toys - I love that they don't charge for postage! Our plan is a simple one, make our home look clean and tidy, touch up the paint, plant some plants, store some of our things (mostly toys, books, clothes and paperwork), and until we have an offer we accept, use family to help out. After having an offer until completion we will try and keep it looking like a show home. Then we will look for our new home and all the toys and books and clothes can come back out. Lets start with my son's primary school, he started a few weeks late as he was on a waiting list for a school place. It's 2.4 miles away from our current house and I don't drive and there's no chance of getting on a bus after school with a pram so it's currently one heck of a mission - I'm not exaggerating when I say I have to set off at 1.30 just to collect my little man from school and it's 4.30 by the time we get home again! Similar houses in our current area in Bromley are about the £280k mark and this time round we will be buying on just one salary - I still have student loan debt so I count as negative equity! the cheek! My biggest fear is what happens if and when we sell our current home - which apart from now being to small for a family of four and too far away from school - is actually lovely and has the best view from the upstairs window, a lovely brand new kitchen and the perfect fireplace. It's only 5 mins walk to a station that takes 20 mins to reach Central London and it's taken us almost 9 years to turn it from the hideous state it was in to a lovely home. There's a lot in our current home, a lot that I will miss and don't really want to part with, I actually really love our current home! But I'm terrified of being priced out of the market, what if we sell and we can't get a home in the area we need? We have to be within a reasonable walk of the school our son is already settled in, we also need to be in a reasonable walking distance of a train station. There's a house up for sale at the moment that is 5 min walk to school - 20 min walk to the train station. It's a semi detached and needs a lot of work - the tiny kitchen and bathroom are dated, as is the conservatory/lean to. There's no off street parking (besides being a prime parking spot for 2 primary schools, it's also opposite an adult college - parking on the street is very difficult on this stretch of road) there's no rear access or garage for the hubby's motorbike. The bathroom upstairs weirdly can only be accessed via bedroom 3 which is so small I don't think you could actually use it as a bedroom - because it's the only bathroom access there isn't actually enough space for a bed. I guess there's potential - there isn't enough room at the front to create off street parking but in the long run, perhaps with planning permission you could do something about the tiny kitchen, replace the conservatory and maybe a loft conversion and lose the weird small 3rd bedroom. But we certainly couldn't afford to do all that or even have the will power to do it with two small kids. But the real kicker - this house is a sickening ridiculous £550k - yep you read that right! Other houses in the area on offer include a semi- detached on a near by street with a garage and an upstairs bathroom you can access without traipsing through a bedroom - at a whopping £620k. A beautiful detached house ticking all our needs - except its right next to an electrical house and opposite an area being treated for Japanese knot wood will set you back a mind boggling family friendly £800k to be frank, I haven't seen anything under half a million - even the real grotty houses in this area full of terraces and semi's - I'm not talking beautiful family homes ready to move into - those, like the one on two streets away from school are an impossible for an average local family to buy at £900k plus. I've been talking to estate agents who all claim that half the houses they sell never make it onto the websites because the sell so quickly. Every single one has been quick to advise me to sell first. Not one has been able to show me that my fears are unfounded and that the "half of their houses" that never make it online are what we can afford and need. In over a year, I haven't seen anything that ticks most of our boxes and is affordable. There's three reasons why prices are so dizzily expensive in the area we are looking at. 1. It's in reasonable walking distance of 5 primary schools. 2. It's within a 25 min walk to a train station into London. 3. Most buyers are second time buyers moving out from Central London and want the station link and can afford to trump the local families who need to be close to the 5 schools. The competition is going to be ferocious - in the unlikely event of something coming up that we can actually afford - it's going to be in less than ideal condition and in need of serious work (I don't want something hideous all over again - we've done mouldy carpets before thank you!). We will be competing with lots of other families and people moving out from central London. And those who qualify for The government help to buy scheme. I'm terrified! Are we setting ourselves up for homeless doom? What on earth do you do if you find yourself priced out of the market?! If only our current home was twice the size and in a different location ha ha!